There is a Native American woman on the cover, along with the image of the Statue of Liberty. This refers to the book’s contention that American democracy was not only based on classical Greek democracy and English common law, but also on the example of the Iroquois League. Images from Colonial days known as Indian Queen and Indian Princess are traced for their influence on female symbolism in the USA. The introductory chapters are full of eyebrow-raising material. The authors are way out in left field on a lot of issues. However, when they finally get to the actual history parts of the book, they make some good points and relate some interesting stories about personalities in American and French history. The authors contrast the Iroquois creation myth in which the world was created by a female guiding spirit and there is a balance between male and female with the Christian culture and its male creator god. The Native American cultures of the East Coast during the Revolutionary period offered examples of societies in which women owned property and had a voice in treaties, law, war, and peace. Revolutionary leaders admired female symbols that included Liberty and the Indian Princess. Although the French creators of the Statue of Liberty modeled her on the Roman goddess Libertas, over time the Statue took on meanings assigned to her by successive generations of Americans. Originally titled Liberty Enlightening the World, the plaque with Emma Lazarus’ the poem about welcoming all people was not added until 1903. Like the Statue herself, the plaque was a donation, but instead of a donation by French, the plaque was from wealthy Americans intending to honor the recently-deceased Lazarus. The stories about the Statue’s sculptor, Bartholdi, are amusing. However, they are sprinkled throughout several chapters instead of being presented in chronological order. Besides being poorly organized, the book is also full of padding. The authors veer off into feminist reactions to oxytocin research. They feel the need to defend themselves from charges of neurosexism due to their contention that men and women are different. This seems an odd anachronism to find inserted between sections of the history of 1700s-era French art production. Then, in the next chapter, there is an entire chapter about oxytocin. Just skip that whole chapter. It’s not about liberty in general or the Statue of Liberty in particular. Rather, it’s a biologically deterministic view of women as natural peacemakers. In this viewpoint, if the world had women leaders, we would have world peace, as if when a woman attains leadership she magically turns into a World Peace Dispenser. That seems naïve in a world that remembers Thatcher, but it’s also not anything the builders of the Statue would have thought about, since oxytocin had not been discovered yet. Just don’t even read this part. In fact, there are a lot of chapters you can skip. In the next chapter, the authors get back to the actual history of the Statue, with “What Lady Liberty Learned from the Indian Princess.” This refers to freedom-related American images and statuary Bartholdi observed on his trip to the USA before designing the Statue. This is a chapter worth reading. Despite the cringeworthy chapter title, this turned out to be an excellent rundown on some little-known history. The authors make their case for the US federal government being patterned after the Iroquois League, an altogether refreshing take on the origins of some of the structures, which are usually said to have been lifted from British structures. When the authors stick to actual history, told in any sort of approximation of chronological order, they do well. They explain why the American Revolution was radical in its time, relating this to both expanded civil rights and deism. The chapter on Goddesses continues the story of the development of the symbols of the Indian Princess and of Lady Liberty in American art history. The Indian Princess lost her popularity during the Revolution when the Iroquois sided with the British. Subsequent chapters continue the history of the Liberty symbol in both official art and folk art. 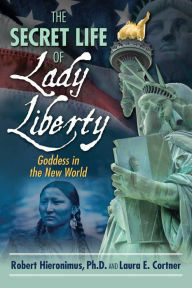 The book goes into how and why the American Liberty goddess came to differ from Libertas. The book also goes into other symbols commonly paired with Liberty, such as Columbia, the eagle, and Uncle Sam. This book alternates between stirring accounts of history related to the Statue, and completely irrelevant forays into other parts of history. The authors debunk several odd conspiracy theories related to the Statue. Those interested in those theories can go directly to the chapter with their theory of interest in the title. Others can just skip those chapters. The chapter “Liberty and Her Sisters” deals with the status of women during and after the Revolution, and with famous women and women the authors think should be famous. There are photos of suffragists parading in costume as female allegories such as the Herald and the Liberty Goddess with her torch. The second to last chapter has some great history about the Statue in modern times, including some wonderful stories about suffragists and Second and Third Wave feminists. However, this chapter is repetitive, and includes a lot of summary from previous chapters. If one skipped a lot of the other chapters, this would be great for catching up on the parts one skipped. The final chapter is about environmentalism. Just skip that. It’s irrelevant to the topic. I really wanted to like this book. The American Liberty goddess is a goddess I honor. I wanted to know everything I would need to know to honor her properly. That’s why I requested a review copy from the publisher. The book does have some great info in it, and I do feel that I learned what I wanted to learn, and some of the anecdotes are well written and interesting, but the book is half padding. It reads like it was written to meet a word count goal. Despite having whole chapters of totally off topic material, though, I am still going to recommend this book for the serious student of the American liberty symbol. Skip the introductory material and the first and last chapters. Read chapters 3, 4, 5, 6, 11, and 13, and any of the chapters on specific conspiracy theories in which one is interested. A casual reader who wants a good read can find better history books about the Statue of Liberty.